Congrats to Leni, who won Talker by Amy Lane! Talker is now available from Dreamspinner Press. Dueling mad magicians, battling possessed beasts, and surviving endless hostile landscapes? Easy. Loving someone you weren’t supposed to? That was hard. A faceless killer terrorizes the Five Lands, one set on killing the ten Oligarchs, masters of elemental magic. It is from this murderer that Dylan, son of the Blue Oligarch, is forced to flee. Only Tyjinn, a brash and unpredictable bodyguard, stands between Dylan and certain death. Rather than play it safe, Tyjinn makes an unusual proposal; to hunt the hunter. This isn’t the only unorthodox idea he puts forth as an attraction blooms between the two young men. In the midst of uncountable obstacles and unforgiving odds, can Dylan really afford to recognize his own feelings? 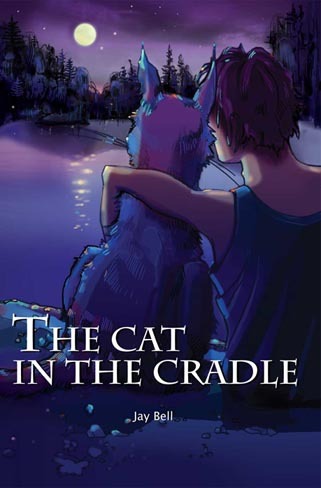 The Cat in the Cradle is Jay Bell’s debut fantasy novel. The novel takes the reader on an exploration of the Five Lands and the different realms of the strange and fantastic Oligarchs. Each Oligarch possesses a different colored loka that enables them to wield a unique style of magic. Dylan, aided by his talking cat Kio, must prevent the lokas from falling into the hands of a power hungry killer before the Five Lands is brought to its knees. 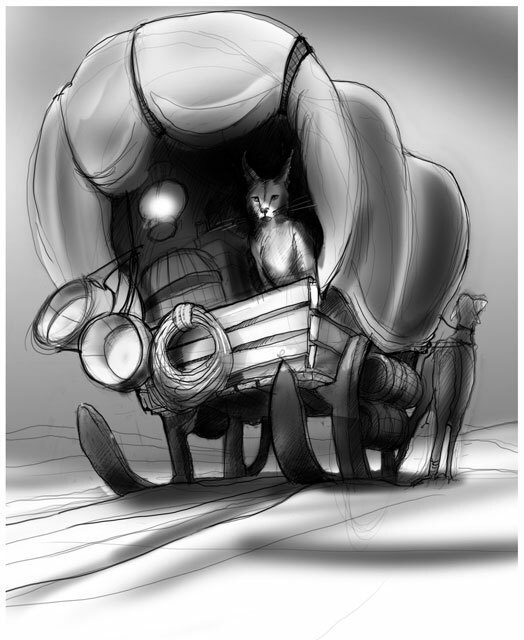 The print version of the The Cat in the Cradle features 25 original illustrations, one for each chapter. Each image was lovingly handcrafted by super-talented (and rather handsome) artist, Andreas Bell, who also provided the wraparound cover art. Due to compatibility issues, the illustrations are only included in the pdf version of the ebook. So those who purchase one of the other ebook versions don’t miss out, a special illustrated companion has been released for all electronic devices. It includes all the artwork in the print version, never before seen concept art, and author’s commentary. This is available for free at Smashwords in a variety of ebook formats. Jay Bell never gave much thought to Germany until he met a handsome foreign exchange student. At that moment, beer and pretzels became the most important thing in the world. After moving to Germany and getting married, Jay found himself unemployable enough to become a writer. Nobody seems terribly disgusted with his debut novel, and the lack of death threats has encouraged Jay to keep writing with two more books due out in the next year. You can find out more about Jay at his website. To enter, leave a comment stating that you are entering the contest. Contest closes 7 pm CDT, Thursday, September 9. Posted by Chris on Wednesday, September 1st, 2010, at 2:00 am, and filed under Contests, Reading. But I promise you that there are naughty boys *inside* the books, May, and you would do well to remove them from the premises. Well, I’m not sure I can read a book by a guy who doesn’t know who Sidney Crosby and the Penguins are but I will give it a whirl. ;-P Something about the cover of that one has always appealed to me, despite the lack of naughty boys. I am entering the contest and I mean that. Although that kitty has pretty big ears, Mayhem. I don’t know…looks suspiciously like a dog to me. A recent post from Brigitte..Its Been a Year!! 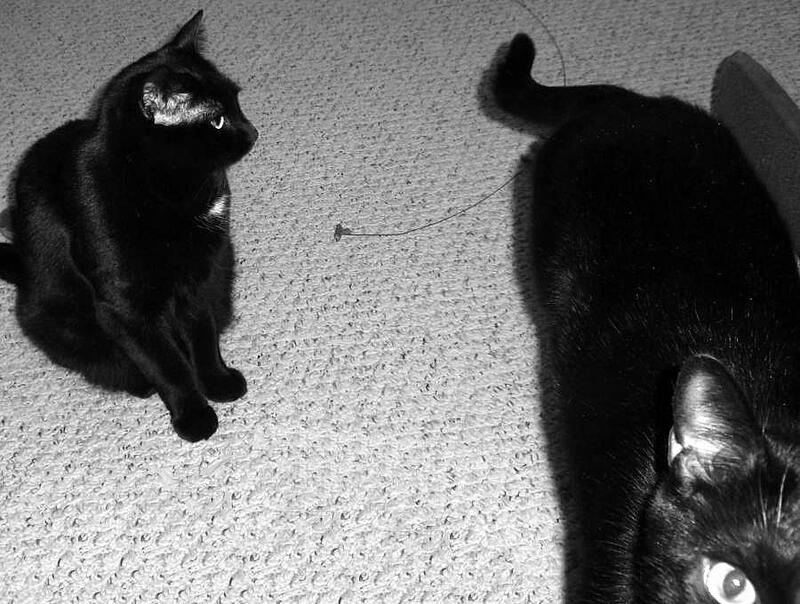 Chaos & May- Yay for kitties. Boo to bad boys. May, that is still a naughty boy on the cover. He is just in disguise! A book about kitties!? That’s so cool, Mayhem. Chaos is a just a spoil sport. please count me in.Sounds pretty good. Sounds interesting, but thanks to that short bio, I’m also interested in the author of this book. Hmm, does it sound strange? Please, count me in! A recent post from Barbara..Giveaways! A book with kittehs? Throw my name in the hat, please! A recent post from kmkat..Bear! LOL! Love the pic and the caption. 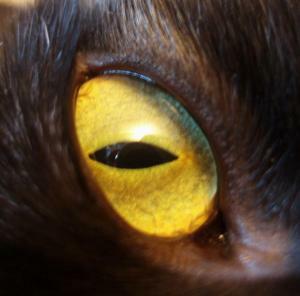 Did you kittys ever read “the Zoom Trilogy” by Tim Wynne Jones? Wicked good adventure. I’m entering the contest. This book sounds great! There is a shocking lack of abs in this post. Even Chaos isn’t baring his chest. Hope you are doing well honey! A recent post from Cecile..OMG Me Love Presents as Much as I Luv Cookies!! I don’t know. Chaos has a point. I’ve never seen a cat work. Please count me in. And yeah, you don’t need to work!! Please enter me in this one as well! That is a dangerous thing to say CTC with this group!